There are as many ways to shoe roping horses as there are horses. Each one is unique, with its own strengths and weaknesses. A sound horse with good conformation, in a desirable environment, would do well barefoot. Yet this scenario is rare. Their riders each have their own set of priorities, skill levels, and schedules to factor in. Because of all these variables, each horse should be assessed as a unique individual. Communication and observation skills are essential in determining how best to shoe each horse in order that he may perform at his peak within his environment. For instance, you would not put sliders on a calf horse that chased cur dogs and wild cows during the week. You wouldn’t square a toe and dub his hind foot if he were weak in his stop. These are all factors you must learn through communication with rider/trainer and or using your observation skills. You should have a good understanding of the horse’s job description. The average age of the rope horses you see at the top end of the game is 15-18 years old. Many of these horses reach the peak of their career with existing maladies and management of soundness is the key factor of these horses. These horses will work temporarily, regardless of what we do to them, as seen in Photo 2. The most common concern of cowboys is shoe pulling. Rarely does a horse of sound mind and body pull a shoe, if the foot is properly balanced and supported. 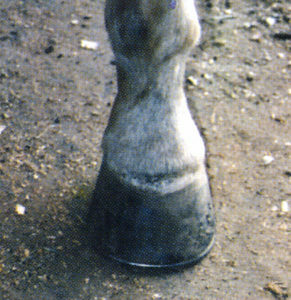 Photo 3 (same horse as Photo 2 after shoeing) In fact, it is less likely under normal circumstances. 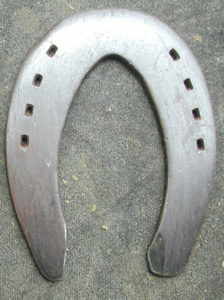 I choose not to cheat any horse of the advantages of proper shoeing because of occasional lost shoes. 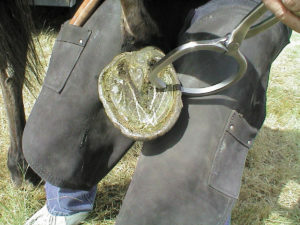 Chronic shoe pulling is most often caused by bad management, such as turning them out in hazardous environments, such as deep mud, fencing on the ground and so on. This is not your fault, unless you don’t point it out and show customers their roles and responsibilities. The management of the equine athlete is a team effort. 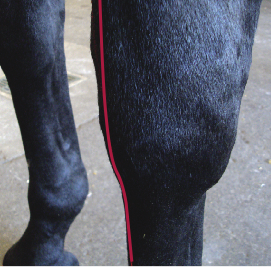 Lameness is a common cause of gait faults. Veterinarians play a key role and can make life less stressful, provided you’re fortunate enough to have a good relationship with the good doctors in your area. It’s amazing how a chronic shoe puller is miraculously cured by a simple hock lubrication. 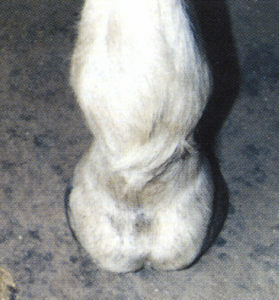 Calf horses, like reiners are notoriously hard on their hocks. It comes with the job. Over the years of practice and study, I’ve developed a picture in my mind of a balanced and functional foot. 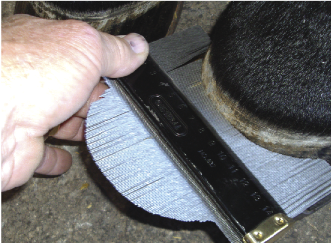 Good basic hoof prep with a little extra attention to details will solve most problems and keep a horse sound under normal circumstances. 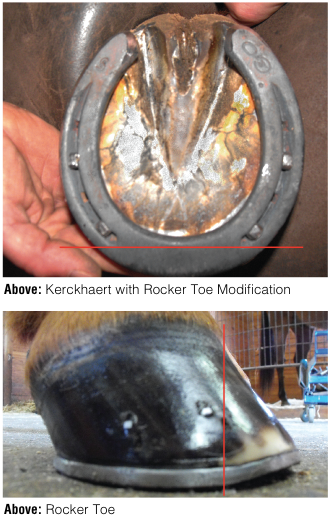 (Photo 4) This is my approach to what some refer to as corrective shoeing. In general, I simply trim away the parts that do not fit the balanced picture. I take away all the excess hoof, but avoid excessive trimming and rasping. 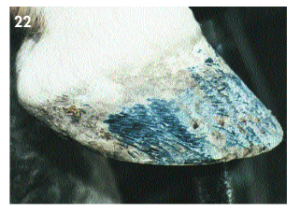 Your goal should be to preserve as much hoof mass as possible. Trim heels to the tallest, widest aspect of the trimmed frog. The frog should be somewhat parallel to the ground. 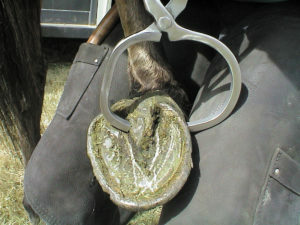 While dressing the outside of the hoof, keep your goals in mind. Fit a shoe that compliments what is trimmed. 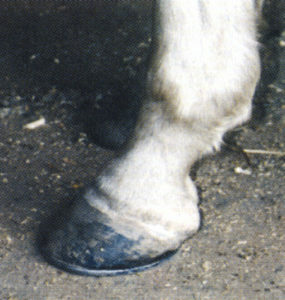 I often choose a shoe based on the hoof’s condition, allowing me to use a smaller nail, for example. I prefer a shoe that is punched coarse. This allows me to nail in the white line, yet still fits the outside perimeter. Hoof walls will become thicker and of better quality if we allow them to. Rasping on the outside of the foot serves no practical function. Your shoe fit and its placement is what does the work (Photo 5). A horse is a horse. It makes no difference what his job is: dressage, walker, or ropers, they need the same trimming principles. The center of the foot is the same respectively. 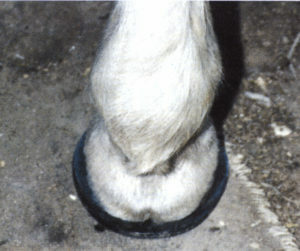 The posterior portion of the foot must balance the anterior regardless of the length of toe and/or hoof conformation (Photo 6). Enhanced break over is very important, yet it’s only part of AP balance. Posterior support is the other half of the equation and must be addressed to achieve AP balance. Think about the posterior portion of the foot, the portion that bears the weight and does the work (Photo 7). Proper hoof prep and shoeing of the hind feet is just as important as the front. If not, a sore or dysfunctional hind can dump extra work to the front and set you up to fail. In order for a horse to stop properly, the hind foot must slide. If the foot is excessively dubbed or pushed back, it won’t function properly. On the other hand, excessive toe length isn’t necessary and can cause undo stress on the limbs. Somewhere in the middle is where I find works well (Photo 8). One quarter inch to 3/8” longer than the fronts is a good place to start. There should be enough toe and or shoe in front of the center of the foot to allow it to stay on top of the ground going in. 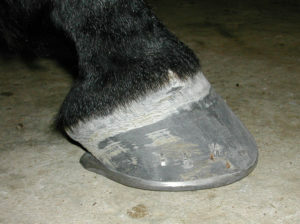 The heels of the hind shoe must be of sufficient length to slide on once it’s under the horse. 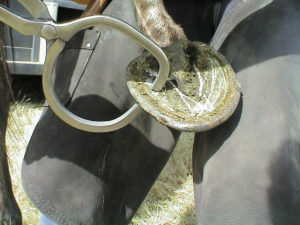 It is sometimes necessary to sweeten or taper the branches of a hind shoe to enable the heel of the foot to fall while the toe stays on top of the ground. The opposite drives the toe straight in, therefore you don’t get the slide you want. Anything you do to facilitate the sliding stop makes it easier on the horse as well as the ropers ability to step off (Photo 9). A hind shoe of adequate length also helps keep them off the front shoes. The extra length causes the hind to plant a little sooner. A horse that spreads excessively in the stop can’t stay in it. 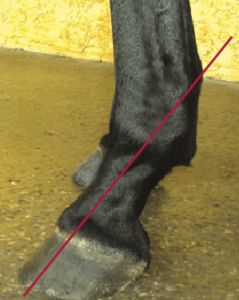 Check medial/lateral hoof balance and make sure your shoe is pointed straight with the frog (Photo 10). It’s sometimes necessary to lower the medial heel and build a shoe with a little extra length in the medial branch (Photo 11, 12). The more educated we are the more confidence we have. We are more able to communicate with confidence, what we do and why we do it. Education and experience is the key to success but also helps you to know your limitations. Nothing is more frustrating than giving your all to a customer with unrealistic expectations. If you learn to listen well and observe, you can pick out the things on which you can have an impact and alleviate complications and disappointment. Education gives you the confidence and skill to handle this aspect of your job well and to your advantage. This article is from The Natural Angle Volume 7, Issue 1 – written by Mike Chance, CJF. For more Natural Angle articles and tips, click here. Mike is living in Tioga, TX and has been shoeing full time since 1985. He has always been active in participating and promoting educational opportunities. 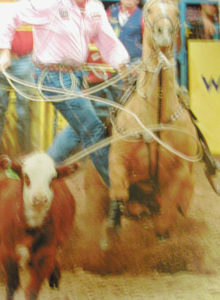 He has served as President of the Oklahoma Farriers Association as well as serving on the Board of the AFA. 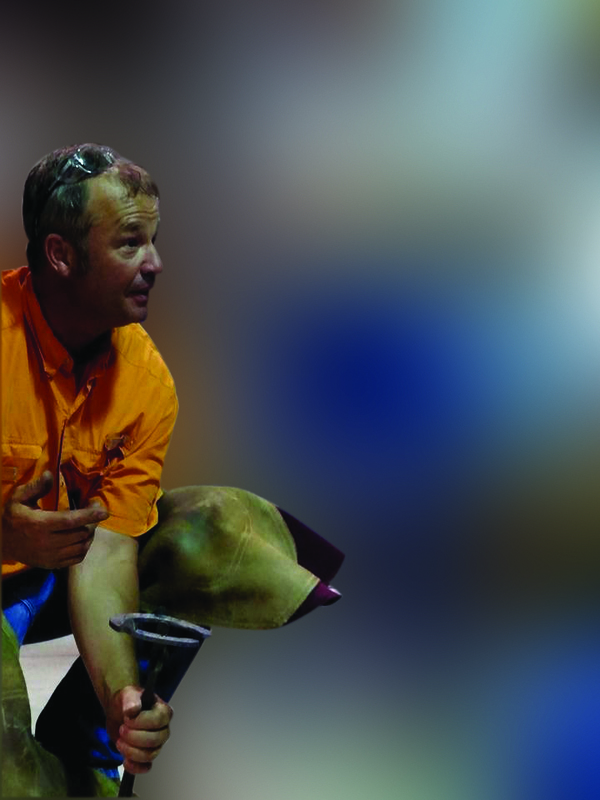 He continues to work with the AFA certification program to help farriers working to improve their skills. While Mike’s work is now divided between Cutting, Western Pleasure and halter horses, over the years he has worked in many other disciplines, as well. 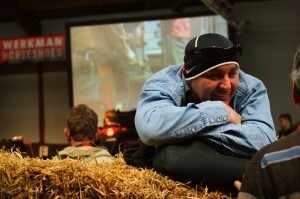 His presentation focuses on a common sense approach to everyday work and maintaining soundness in performance horses. Most seasoned farriers will agree that a good hoof tester is a must in your shoeing tool collection. 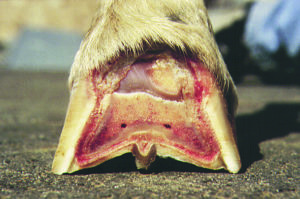 When used properly you can determine an area where a hoof has pain. The key thing here is to know how to use them correctly. Assuming that we have chosen the foot that is affected, the first thing to do is clean up the feet. I almost always start with the sound foot first. This allows me to get the feel of a normal squeeze for that horse. Before picking up the foot take a good look at the outside. Make sure the wall is free of mud, manure or hard dirt that will hinder the hoof tester from working properly. 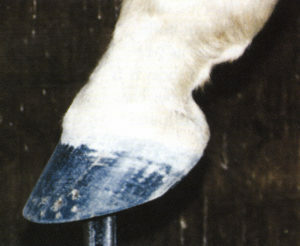 Is there any sign of hoof wall cracks or an inflamed coronary band? If not pick up the foot and clean the bottom. 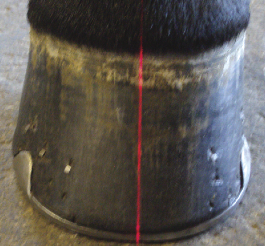 It is very important to have a routine when using hoof testers. 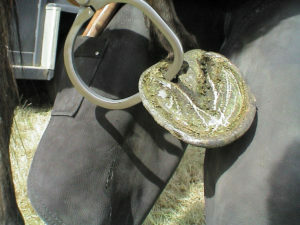 If you have never used a hoof tester before I think you should practice first on a small ball. Tennis balls are great for this. A tennis ball will give a little just like a hoof. Squeeze the ball until you have the ability to apply the same pressure each time your hands close the handles. I still do this occasionally just so my hands are familiar with that feel. I start on the outside of the foot just behind the bar and squeeze. Move from that area forward about an inch squeezing with the same amount of pressure. Continue around the foot ending up just behind the bar on the inside of the foot. If you find an area that the horse reacts to don’t stay in that area and continue to squeeze. Continue around the foot then start over to see if you get the same response in the same area. If you are sure this is the spot you have to determine if it is your job or the vet’s to continue. If I feel it is a hot nail I pull the nail and let the caretaker of that horse know what to do. Even if I am sure what is causing the sensitivity, I suggest that the vet be called and informed of the problem. I do not start digging on the bottom of a hoof. This could be a very negative thing to do. If I do not get a reaction on the sole then I squeeze each side of the frog and across both heels. 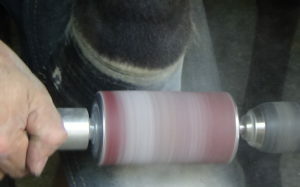 One point I would like for every one to remember is that the side of the hoof tester you don’t see is also working and applying pressure to the outside of the foot with every squeeze. For this reason I like to keep that side no higher than about one-third the height of the foot or where our nails should be. If you get higher than that (especially on a thin walled horse) the horse may show pain in the outside and you may mistake it for sole pain. As with every horse I feel if we observe the horse while being led from the stall, working and or just standing before we start to work on it we may be able to determine where the problem is. Look close, pay attention, and develop your eyes and ears. 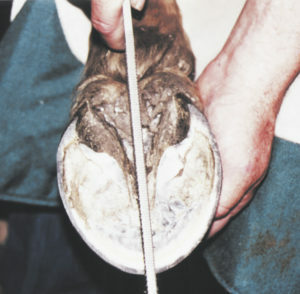 Practice using your hoof testers on a tennis ball before using them on a horse and you will be more successful finding the sore spot on a hoof. This article is from The Natural Angle Volume 6, Issue 2 – written by Dave Farley, CF APF-I. For more Natural Angle articles and tips, click here. 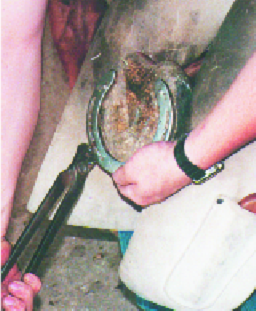 Dave Farley, CF APF of Coshocton, Ohio has been shoeing horses for over 40 years. He has shod for a broad range of disciplines, including Western horses, Reining, Dressage, Hunters and Jumpers. His business today is focused on Hunters and Jumpers on the “A” circuit. Throughout his shoeing career he has participated in educational functions. For a number of years he has been doing shoeing clinics in the US and Canada, many sponsored by FPD but also as a guest speaker and clinician at events like the AFA Convention and the International Hoof Care Summit. 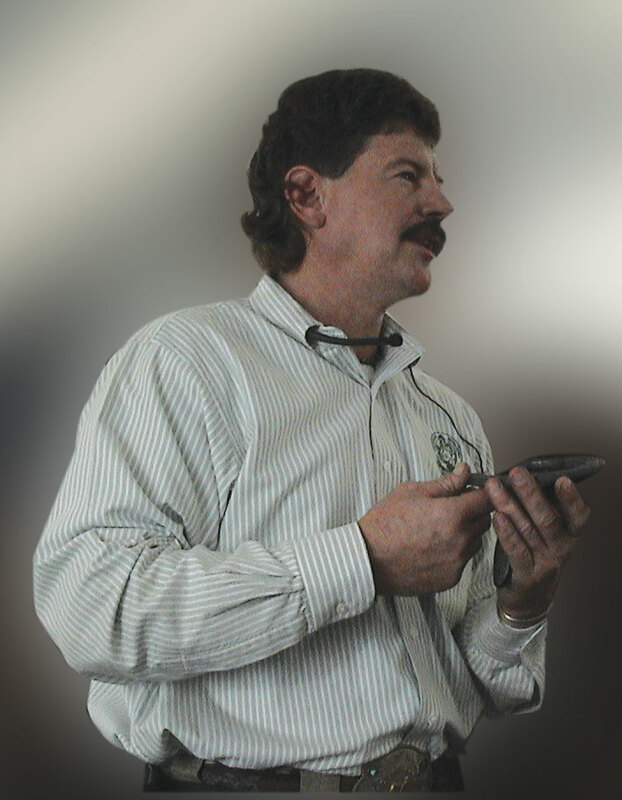 In 2000 he received the Clinician of the Year Award from the AFA, in recognition of his contributions to the industry. In 2008 he was inducted into the International Horseshoeing Hall of Fame. Dave is known for his willingness to share his knowledge and experience with farriers throughout the industry. His dedication is obvious to those who have heard him speak in the past. 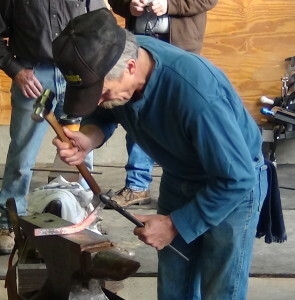 Dave is a founding member and Immediate Past President of the American Association of Professional Farriers. This is a national farriers association focused on continuing education for the trade. He also partnered with Roy Bloom to form a video company called Hot Iron Productions. The goal of the company is to produce top quality video footage to help explain shoeing and forging concepts, including their latest issues, 12 Points of Reference – Balancing the Equine Hoof and Shoeing the Jumper. 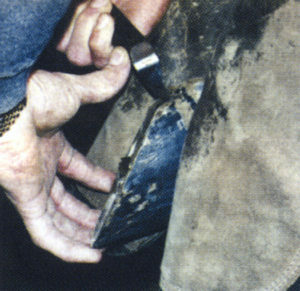 One of the constant struggles in shoeing horses is the effort to establish and maintain good hoof shape. It is not unusual to have a horse come to you that has been fit to the perimeter, a method many of us used to think was good horseshoeing. But as time goes on we often find that we have problems when we shoe using this principle. You will often see a long toe as well as excessive flares. 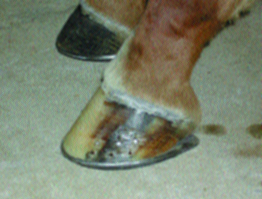 A hoof that has flares and dishes will often have flatter soles and uneven growth patterns. 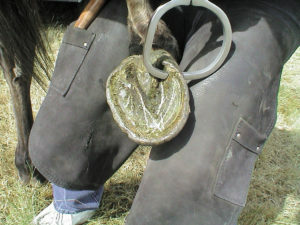 You can see this in the rings on the outside of the hoof. 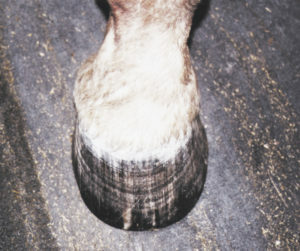 A well-balanced hoof has a good blood flow and will grow more evenly. If you don’t change this shape problem you will also have more difficulty shaping shoes and getting a good strong nail pattern. 1. Looking at right hind to see if foot is centered to leg. 3. Partially trimmed, you can see the thickness of wall at toe quarters, particularly lateral toe. 4. Medial toe is blended now you can see the contrast even more on outside toe. 5. With both toe quarters blended the foot now has a more symmetrical shape and consistent wall thickness. 6. With foot on ground, you can see that the flares are greatly reduced. The photos in this article show feet that have been perimeter fit, resulting in an imbalance from my perspective. 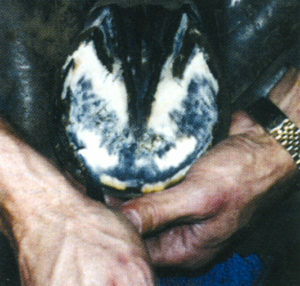 I try to trim and shape the foot so that the freshly trimmed frog is in the center of the hoof capsule. This is a goal but remember that you can’t always do everything in the first shoeing. This often means there are flares that need to be removed. I generally start this with the foot up on the stand and rough it in when I remove the shoes. This gives me a good view of the shape of the coronary, which is also a very good guide for what the hoof shape should be. With the foot in trimming position, I can now gauge the thickness of the wall and the balance from inside to outside- again using the frog as my center. I will even up the wall thickness as much as possible now. This provides a guide for me when I take the foot forward again and work to remove more flare. You have to use some discretion in taking flares off. You don’t want to take so much that the wall will be weak and you will have difficulty getting strong nails in place. Even in the toe area you should use caution. It’s better to set the shoe back than to take all the horn away. 7. This front foot has a considerable flare to the inside. 8. As we did with the hind foot, we are taking wall from the areas that have excess thickness and are out of symmetry. We do this before dressing the outside wall. 9. We’ve done all we want to in this first effort to establish better balance. If you work to achieve more symmetry in the trim you will find your horses come back to you in much better shape. You are encouraging good hoof growth as you develop your eye for trimming this way. You will find your work getting easier each shoeing. Shoe fit becomes much less of a struggle. In my work I have found that using front and hind pattern Kerckhaert shoes has fit with these shaping principles very nicely. It is apparent that Kerckhaert has put a lot of effort in developing the shapes of their shoes to match what the shape of a well-balanced foot should be. This article is from The Natural Angle Volume 5, Issue 2 – written by Dave Farley, CF APF-I. For more Natural Angle articles and tips, click here. There are many thoughts on the subject of break over as it pertains to the horse’s foot and limb function. I would like to discuss some of the options we have using modifications to keg shoes, as well as shoes manufactured with modifications built-in by the manufacturer. This is my opinion only but I do not like to set shoes back off the toe in most situations. I prefer to fit the foot and modify the shoe to alter break over of the foot. There are many variations that we can use and it can be like putting a puzzle together, every time we add a piece the picture becomes more visible. There are many things to consider when determining type of modification or shoe we use for each horse, but my starting point is conformation, age, job or discipline, and type of footing the horse is working in. The three basic modifications I use most are rolled toe, rocker toe and half round or roller type shoe. The rolled toe is a simple modification that can be achieved with your hammer, rasp, grinder or manufactured shoe. The foot surface of the shoe remains flat and the ground surface of the toe is beveled to reduce leverage or purchase of the toe. I find this modification helpful with horses being worked on synthetic footing. 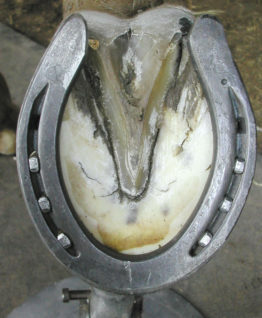 Synthetic footing for the most part does not allow the foot to slide or slip at all and by reducing the purchase of the toe the horses seem to move better and stay sounder. For the most part, I roll the toe of my shoe with my grinder on keg shoes. And, I also like the Kerckhaert Comfort shoe in steel and aluminum because the toe is already rolled. The rocker toe is a more aggressive modification achieved by breaking the plane of the foot at the toe on the shoe and foot. This modification allows you to move the break over point farther back than the rolled toe while still maintaining weight bearing on the toe wall. I like this modification on many of my older horses. I think it gives them a little help dealing with those old joints. I will also rocker the toes for some horses on synthetic surfaces for the same reasons I mentioned above. Roller or Half round shoes have the entire outside and inside edge of the shoe beveled or rounded from heel to heel. These are great shoes for that conformational challenge you may encounter. 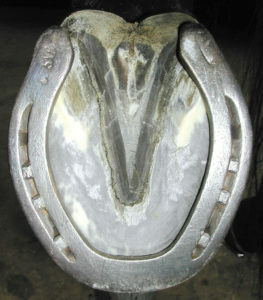 The design of the shoe allows you to shoe the foot without creating corners the horse will need to compensate for while moving. I like this shoe on horses that are working on a firmer surface, it gets in the ground a little bit and its rolled design can compensate for some conformation issues, such as angular deviations causing slight toe-in or toe-out. I like the Kerckhaert SX Roller in smaller sizes up to 1 and the Classic Roller for larger feet. I do not believe that all horses need to have enhanced break over. I think horses need all the purchase they can physically use but that is different in all horses. Do not be afraid to experiment. What you experience on your own, you will never forget, especially the things that don’t go your way. This article is from The Natural Angle Volume 14, Issue 1 – written by Doug Workman, CJF APF . For more Natural Angle articles and tips, click here. Doug started shoeing horses full time in 1989. He completed his AFA certified level in 1992 and the Certified Journeyman certification in 1994. He has been a member of the Georgia Professional Farriers Association since 1992 and has served as President. 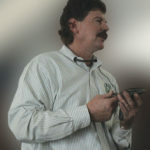 He became an approved tester for the AFA certification in 1998. Doug is currently a board member for the newly formed American Association of Professional Farriers. Doug’s practice is concentrated on shoeing Hunter/Jumpers and Dressage horses. His passion is helping others achieve their goals in the farrier trade as his many mentors have helped him to do. He has been working as a clinician with FPD for the past few years and has received positive response to his common sense approach to shoeing. This steel handled bob punch needs immediate dressing of the struck end. Never let your tool reach this stage before dressing. Notice the missing pieces. You’ll need a full suit of armor to protect yourself if you let your tools get to this point! From struck end you can see again the dangerous situation that has developed and needs immediate attention. The struck ends of these tools are softer to avoid damage to your hammers, but must be dressed on a regular basis. This punch has been in hot material for too long, resulting in the heavy coloration seen here. 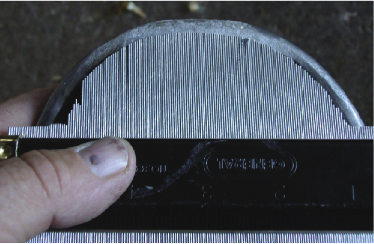 Get your tools in and out of the material quickly and don’t allow this kind of heat buildup. The damage that results is because of misuse, not because the tool is defective. Always wear your safety glasses. You are striking steel against steel and working with hot material. Anything can happen, so be safe. Always strike the tool in the center of the striking surface. Striking off center or on the edge will cause breakage and possible injury. Always strike the tool with the round face of your hammer. 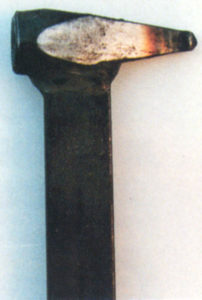 Striking with the flat face causes deflection off the rounded surface of the tool. The round face of your hammer produces a solid hit. Always pritchel at a black heat. This allows you to shear the material and avoid heat buildup in the pritchel. You will get much longer life from your pritchel and better nail holes. Always maintain your tools. If your tool should mushroom on the struck end, grind off the mushroomed area. If the working end should deform for any reason, regrind to the proper size and shape. Do not overheat. Never let the working end of your tool get too hot. Allowing your tools to remain in hot material too long will create a heat buildup in the working end of the tool that will destroy the heat treat and hardness of the tool. The result will be deformed working ends. This is especially critical with the forepunch and drift. Never put the tools in the fire to adjust. 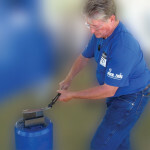 Excessive heat will destroy the heat treating and render the tool useless. 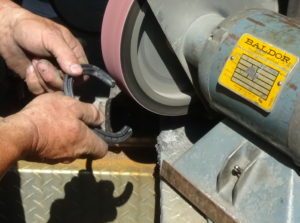 Excessive heat will also destroy the weld on some tools and cause the weld to crack. (An exception would be tong adjustment and pritchels which can take some heat). Never quench your tools in water. If your tools get hot they should be allowed to air cool. 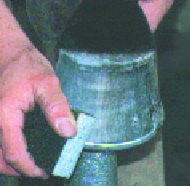 In normal work we recommend that you dip your tools in a hoof packing formula to provide cooling and lubrication. Never quench your tongs in water. If you make adjustments to your tongs do not quench them. Allow them to air cool before you use them. In normal work, you can quench them in water provided there is no color in the tong. This Tool Corner is from The Natural Angle Volume 3, Issue 2 – written by Roy Bloom, CJF APF-I . For more Natural Angle articles and tips, click here. Roy Bloom has been shoeing horses since 1973. He has been a member of the American Farrier’s Team on two different occasions and for many years served as the manager of the team. Roy has always been willing to share the extensive knowledge he’s gained over the years with members of the farrier industry. 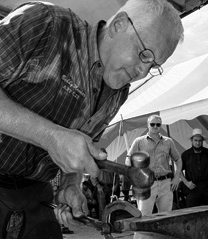 In addition to his farrier background, he developed a strong interest in blacksmithing and tool making and for many years has been manufacturing a broad range of farrier and blacksmith tools. He also has a fully equipped shop and the ability to do a wide variety of ornamental and artistic work. Roy’s work as a clinician has earned him the Educator of the Year Award from the AFA and a position in the Horseshoer’s Hall of Fame. Your customers may never lift the foot to check your work but you can be sure they take a good look at the hoof as the horse is standing in front of them. A few minutes spent on a good finish will go a long way in keeping your customers happy. We start our finish work when we pull the shoes. This work, as with most of the finish work, is done on the foot stand. 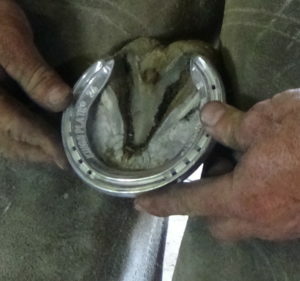 This allows us to take a good look at the hoof and get some of the finish work done as a part of pulling the shoes. After cutting the clinches, we use the file side of the rasp to clean up the wall and begin to shape the hoof. We like to use the Bellota rasp which doesn’t have a real coarse file side. On foot stand, use file side to begin clean up. One thing we want to avoid are deep marks in the wall. Doing this work now also keeps us from having to worry about rasping around the clinches (or clips) after nailing the shoes on. At this point we pull the shoes, using a crease nail puller to avoid any wall damage. After pulling the shoes be sure to clean the wall all the way to the end of the heels. It’s sometimes difficult to get to this area when the shoe is on. 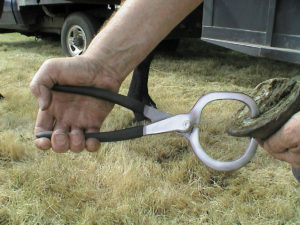 Crease nail puller minimizes hoof damage. Clean up heel area after pulling shoe. After nailing, we bring the foot back to the stand and use the undercut before clinching to avoid marking the wall. Once we’ve clinched we lightly file the foot if needed. By using the undercut we can often bypass this step and go right to the sanding block. A good run with the sanding block should remove any file marks. 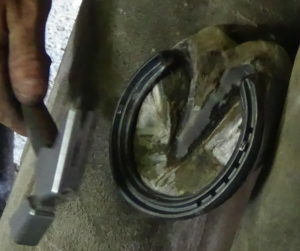 Our final step is to apply a sealant like the Diamond Hoof Defender. 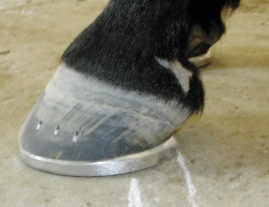 This can help with maintenance of the hoof. It only takes a minute and the customers appreciate the extra touch. Remember what they see when you’re finished. After clinching, use file side if needed. Sanding block provides smooth finish. This article is from The Natural Angle Volume 2, Issue 2 – written by Dave Farley, CF APF-I . For more Natural Angle articles and tips, click here. 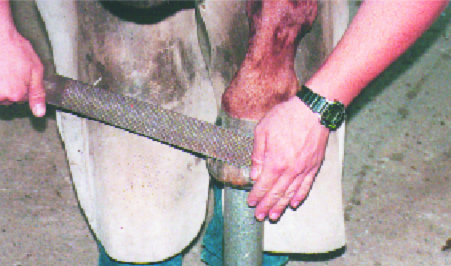 What is it Like Shoeing a Million Dollar Horse? Guest Blog by Rob Logsdon, FPD, Inc.
Lexington, Kentucky is largely considered the “Horse Capital of the World” because of the numerous horse farms, Keeneland Racecourse and Keeneland Association Thoroughbred Auctions. From September 10 to 23, Keeneland is hosting their September Yearling Sale, recognized as the top horse sale in the world. To date, the 2018 September Yearling Sale has sold 26 horses for $1,000,000 or more. The 2018 sale topper was a $2.4 million yearling shod by Brandon Coats, CJF for Hill ‘n’ Dale Sales Agency. Sale yearlings awaiting Kerckhaert DR 15×7 shoes. Brandon Coats, CJF fitting Kerckhaert Kings Plate. I recently visited with Brandon and farrier Mick Maynard while they were working at Stonereath Stud. 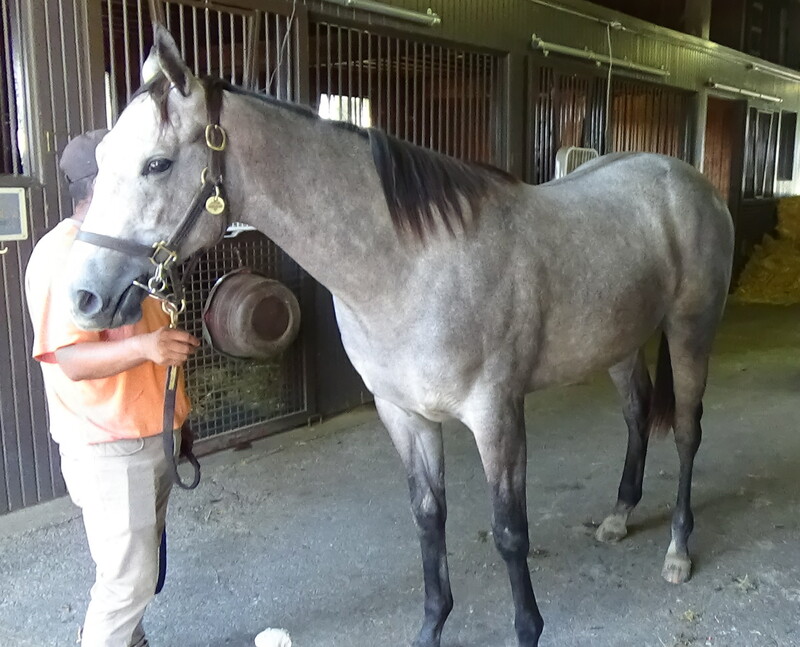 The yearlings they were shoeing with various Kerckhaert horseshoes (DR 15×7 and Kings Aluminum) are to be sold this weekend at the Keeneland sales. Brandon explained that the majority of his work is for breeding farms, specific to selling horses and that he typically begins when the yearlings are babies. The farrier is the first line of defense in regards to a horse’s conformation and for the first two months these babies are evaluated and trimmed every 8 to 14 days. After two months the farm manager, farrier and vet review the farrier’s notes and devise a plan for the horse. 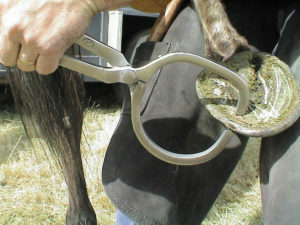 When a horse is a yearling, their trimming schedule typically is extended to every three weeks until they are sold. The ultimate goal is to sell these yearlings for the highest price possible. There is a saying in Lexington, “breed the best to the best and hope for the best.” There is a lot of work, time and luck involved with these million-dollar babies. The farrier is instrumental and invaluable for these horses to reach their full potential in the sales arena. Brandon Coats, CJF nailing on Kerckhaert DR 15×7, using a Liberty 7 oz. 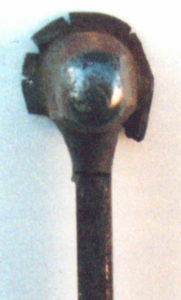 Driving Hammer. Brandon Coats, CJF safing edges on the Kerckhaert DR 15×7 with a Baldor Grinder and 10” expander wheel. Mick Maynard finishing with the FootPro Hoof Buffer. Mick Maynard applying the finishing touch. 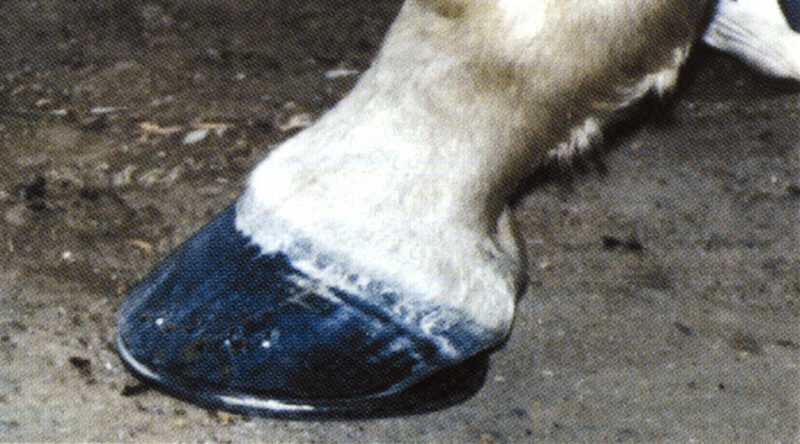 Most of the yearlings sold are fitted with the Kerckhaert DR 15×7 steel shoes. 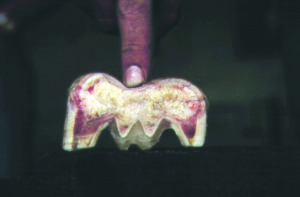 The shape, fit and nail punching make this the preferred horseshoe for sale yearlings. 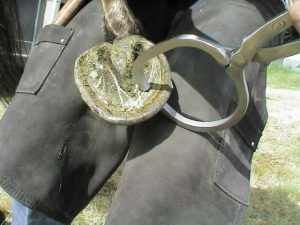 The Kerckhaert Kings Plate Aluminum will be used if the yearling needs a lighter and wider web horseshoe. To learn more about the Keeneland Sales, visit http://keeneland.com/sales. Kerckhaert is the shoe of choice. 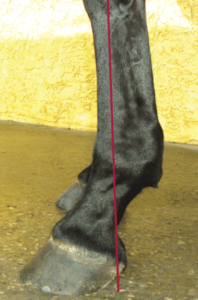 We have developed a list of reference points that have helped us in evaluating limb balance and developing a plan for trimming the hoof to maintain or enhance the balance. The following list and images give a good overview of those points and will hopefully give you food for thought in your daily work. 1. The knee. While standing to the side of the horse notice the plane of the knee. This is important as the direction of the plane of the knee affects break over. Also, from the same position, look at the cannon bone and its relationship to the knee. Is it normal, or is it offset medial or lateral to the knee? 2. 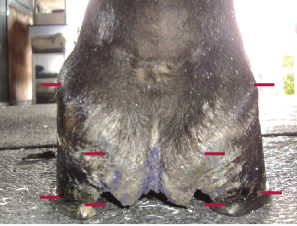 While in front of the limb, draw a perpendicular line down through the center of the cannon bone through the pastern and exiting the center of the hoof. 3. Look at the coronary band (frontal view) and its relationship to the ground. 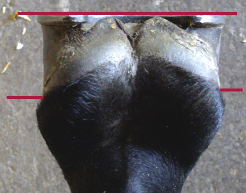 Compare the medial and lateral lengths of hoof wall from this view. 4. 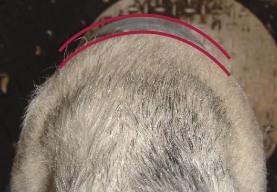 Now check the hoof edge or shape in relationship to the coronary shape. 5. From the side (lateral view) of the horse, draw a perpendicular line down through the cannon bone to the highest, widest part of the frog. Position the heels to that point. 6. 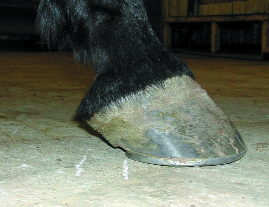 From same viewpoint, compare the hoof and pastern alignment. 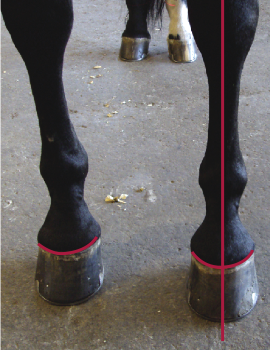 Toe length, heel height and length of pastern should be used to determine normal alignment. 7. From behind the limb (posterior) draw a perpendicular line down the center of the cannon bone through the pastern and through the center of the frog. 8. 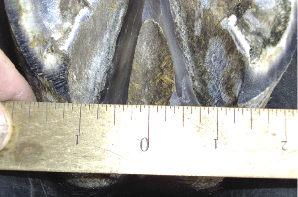 Also from the posterior view, compare heel heights and both medial and lateral wall heights. 9. 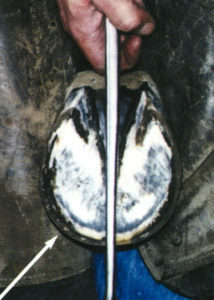 In the farrier’s position (FP) of holding the foot, look at heel positioning in relationship to highest, widest part of frog. 9a. 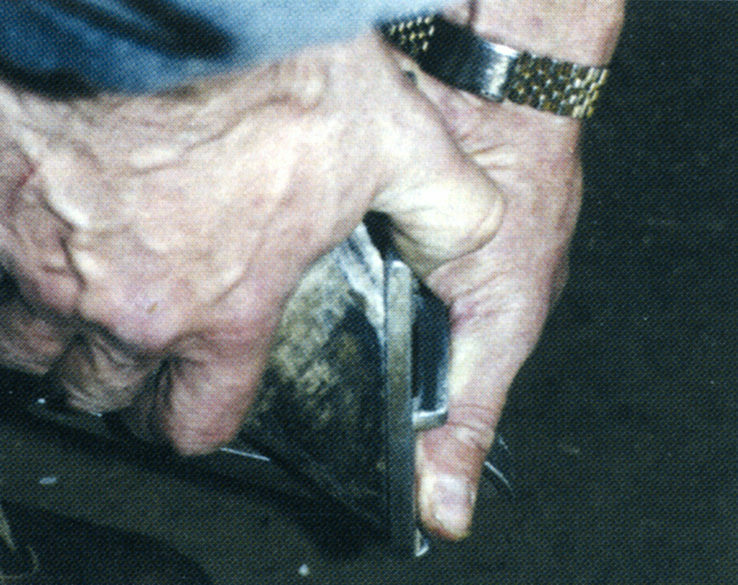 In the farrier’s position (FP) of holding the foot, look at heel positioning in relationship to highest, widest part of frog. 10. 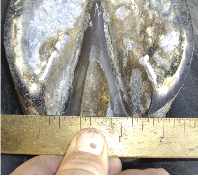 From the same farrier’s position (FP) find the medial/lateral center of the frog (approximately 3/8” back from the point of the frog). Measure from that point to the widest part of the quarters, both medial and lateral and compare measurements. 11. 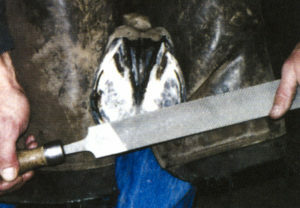 From the farrier’s position (FP) sight the foot to measure heel length and the level of bottom of foot. 12. 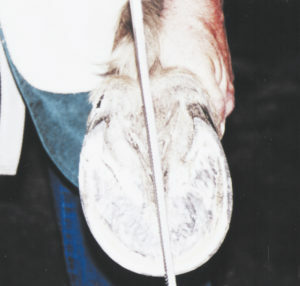 With hoof on the foot stand, sight over the coronary band to compare the shape of the hoof edge to the coronary band’s shape. A contour gauge can be very helpful in comparing coronary band shape to the toe. 12a. 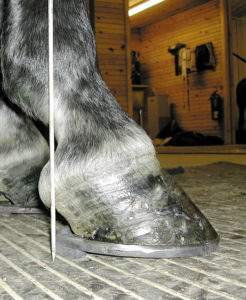 With hoof on the foot stand, sight over the coronary band to compare the shape of the hoof edge to the coronary band’s shape. A contour gauge can be very helpful in comparing coronary band shape to the toe. 12b. 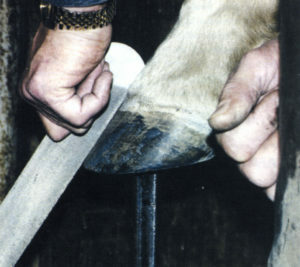 With hoof on the foot stand, sight over the coronary band to compare the shape of the hoof edge to the coronary band’s shape. A contour gauge can be very helpful in comparing coronary band shape to the toe. The challenge you face in establishing good hoof and limb balance is lessened when you develop your overall perspective of the limb. These reference points are a good guide to help with that effort. It’s nearly impossible to accomplish your goal of achieving good balance when looking only at the hoof when in working position. We’ve found these points of reference to be invaluable in our everyday work. We look forward to going into more detail on the variations we see in these reference points in the video series and future articles. This article is from The Natural Angle Volume 11, Issue 4 – written by Dave Farley, CF APF-I and Roy Bloom, CJF APF-I. For more Natural Angle articles and tips, click here. One of the best ways to prepare for the practical portion of the AFA certification test is to study the guidelines set forth in the AFA pamphlet “Guidelines for Evaluating Farrier Competitions and Certifications” and incorporate them into your everyday shoeing. 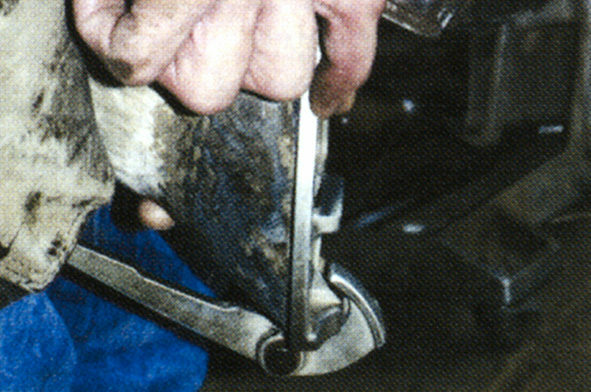 The accompanying photographs outline proper hoof prep as desired for certification as well as illustrating some of the common errors seen by examiners. 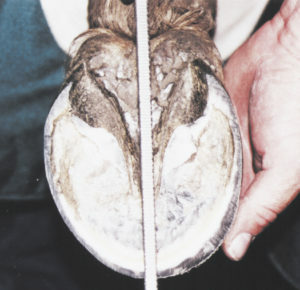 It is important to note that all hoof prep must be completed and will be judged before you can proceed to the next step of nailing on the shoe. 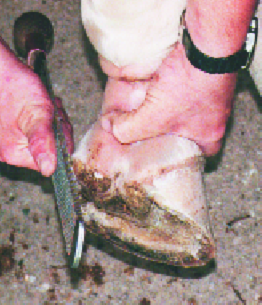 The benefits of integrating these guidelines into your daily shoeing are twofold. Not only will you gain experience that will help you formulate your game plan for test day, but the principles outlined in the guide result in a nice, solid shoeing, definitely an asset to your business. Photos 1, 2 and 3: It has been 7 weeks since the last shoeing. The foot runs forward and carries a medial toe flare. 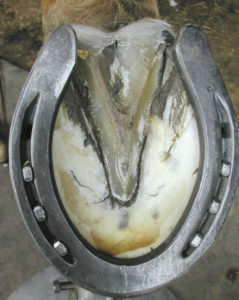 Photo 4: Clean bulb and heel area. Start to establish the widest portion of the frog using the angle of the heel. Photo 7: Check how the foot centers around the frog. 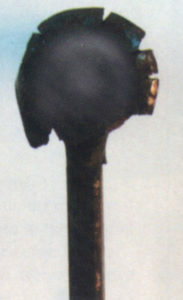 Note how the toe pulls to the medial side. Photo 8: The foot was trimmed with the nippers and the heels were brought back to the widest portion of the frog. Photo 9: Check balance by using the long axis of the leg. Photo 10: Level the foot trying to establish a flat surface to have solid contact with a flat shoe. Photo 11: Check for a flat surface. Photo 12: Use edge of finish file or rasp to check dishes and flares. Photo 13: Using the fine side of the finish file. 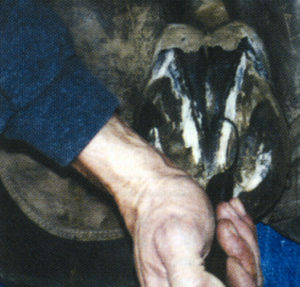 Try to improve the natural shape of the hoof and remove any deep gouges or rasp marks in the wall. Photo 14: Sand block the wall and the back of the heel area to smooth everything. This helps to give a nice finished appearance. Photos 15 & 16: These show the finished job. The wall is smooth and straight with no deep rasp marks or gouges. 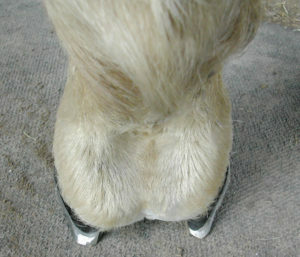 The edges are smooth and rounded so that there is no injury to yourself, the horse or the examiner. The toe is not dubbed and the dishes and flares have been dressed without endangering the nailing job. Photo 17: Lateral view, resetting the same shoes. 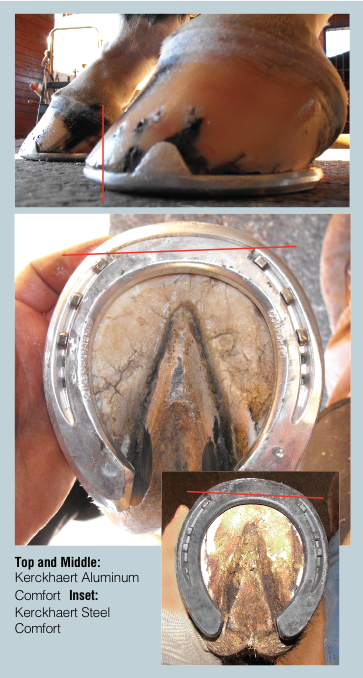 Shows how much improvement was made through good hoof prep. The mistakes shown in photos 19-24 would result in scores less than 6. 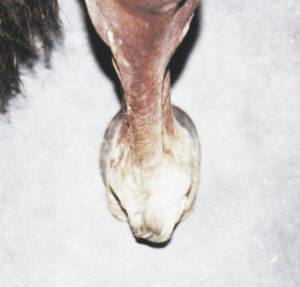 Photo 18: Posterior view showing heel support with the fetlock in the center of the hoof. The shoe fit in the last two photos are not to certification standards. Photo 19: The frog is over-pared. The knife was laid over against the frog when it was cut. The sole is not pared smooth. 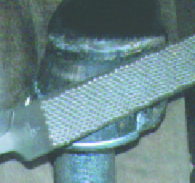 There is a knife mark left in the toe area and the bar and heel area are left untouched. 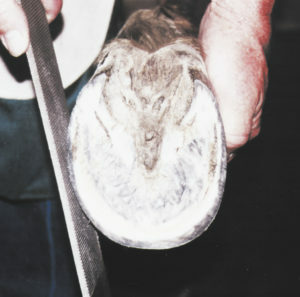 Photo 20: The foot has been trimmed out of balance. The bulb area has been left untouched. Photo 21: The bottom of the foot is not level. There is a gap in the toe and quarter area. Photo 22 & 23: The dish in the toe hasn’t been dressed. Deep rasp marks are left in the wall. The heel area hasn’t been touched and the edge is not smooth. Photo 24: You will be stopped for drawing blood, unless an AFA examiner feels that it could not be helped. This article is from The Natural Angle Volume 4, Issue 4 – written by Bobby Menker. For more Natural Angle articles and tips, click here. Bobby Menker is an AAPF/CAPF Accredited Professional Farrier (APF) and an AFA Certified Journeyman Farrier (CJF) with over thirty years of experience shoeing Western and English Performance horses. His clients include multiple AQHA World Show and Congress champions, NRHA futurity and derby winners, as well as successful Grand Prix competitors. His specialties include supportive shoeing for the high-level athlete. 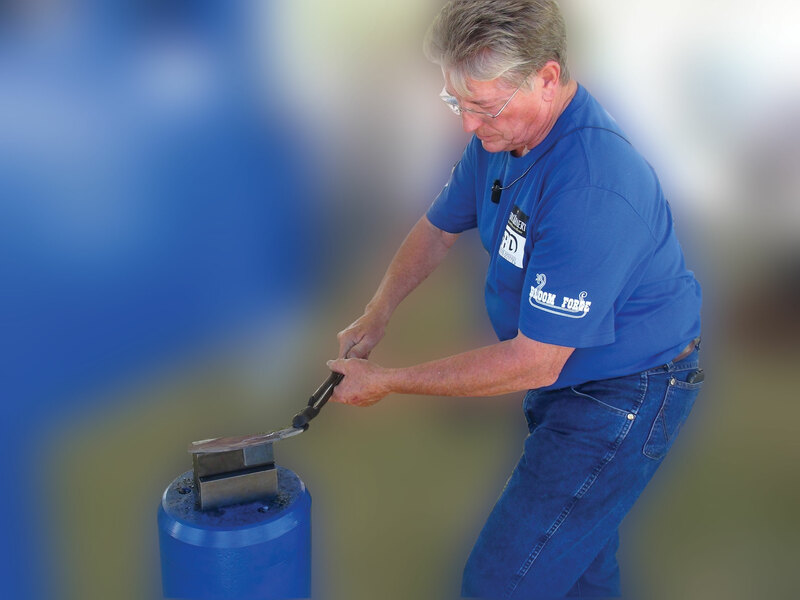 A past AFA Examiner and frequent clinician, Bobby has been consistently involved in efforts to bring more educational opportunities to farriers. In order to gain a better understanding of how to approach a variety of situations in foot care, a working knowledge of the parts of the foot and leg and how they relate or ‘communicate’ with each other is necessary. 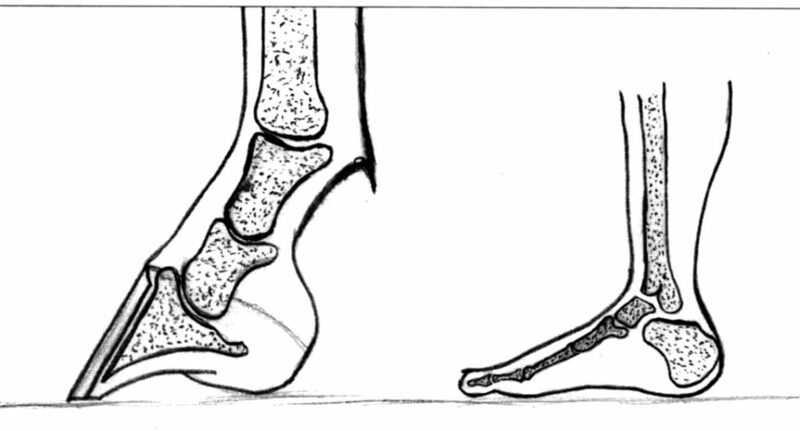 This sketch illustrates the differences of bone contact to the ground between a horse and human foot. Notice the horse’s coffin bone is suspended while the human’s foot has direct ground contact. In nature, the general rule is that form follows function. Therefore, if you understand how a particular structure or system works, it is much easier to remember its parts. The names and types of bones in horse limbs are almost exactly the same as ours. So, if you know anything of your own anatomy, it’s much easier to remember horse anatomy. For example, both the human and the horse have a scapula, humerus, radius, ulna, carpal bones, metacarpal bones and three bones called phalanges that make up our digits. However, the functions of our arms and those of the horse’s forelimb are completely different making the arrangement and lengths of bone, and number of digits more suited to the needs of each animal. One of the main differences between our feet and horses’ feet is that our feet are much bigger in proportion to our body weight than the horse. Our feet don’t deal with anywhere near the concussion that a horse does. If you look at the form of our feet, the bones are in almost direct contact with the ground, protected only by skin (sometimes callused) and small fibro-fat pads, which allow for easy bruising of the underlying bones when barefooted. Conversely, if we consider the horse’s foot, its form is designed to withstand tremendous forces. Basically, the bones of the horse’s foot (the coffin and navicular bones) are protected from direct contact with the ground by being suspended within the hoof capsule via the laminar bed. locomotor systems to incorporate both of these characteristics. By design, the feet and legs of horses must be able not only to bear the animal’s full weight but dissipate enormous amounts of shock generated as the foot hits the ground at high rates of speed in order to maintain soundness. In addition to weight bearing and shock absorption, the foot must provide some natural traction and serve as a venous blood pump to clear the blood from the foot on its way back up the leg. Let’s look at it another way. When the average size horse (1000 lbs.) is breezing along at 30 mph the concussion that each foot and leg must deal with per stride is approximately 10,000 lbs. How does the very porous 2 1/2-ounce coffin bone handle this violent impact with the ground without fracturing? Because the foot is the first thing to receive the impact of the ground at speed it is the first line of defense in dissipating that energy. In order to accomplish this, the foot must be both strong and elastic. Much like an engineer will combine the strengths of steel and concrete to build a foundation that not only can handle incredible weight, but also will have some ability to yield to changing conditions, the horse has developed a highly specialized form in its leg and foot that utilizes several different types of “materials” or tissues that when combined together are stronger than any of them alone. The design of the foot utilizes bone because it is best suited to resist compression. The coffin bone being porous would at first glance seem very fragile. 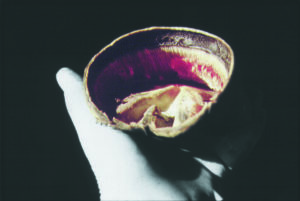 But, when this bone is engorged with blood it is as strong as very dense bone and can have some elasticity if needed during the peak loading times of the stride. 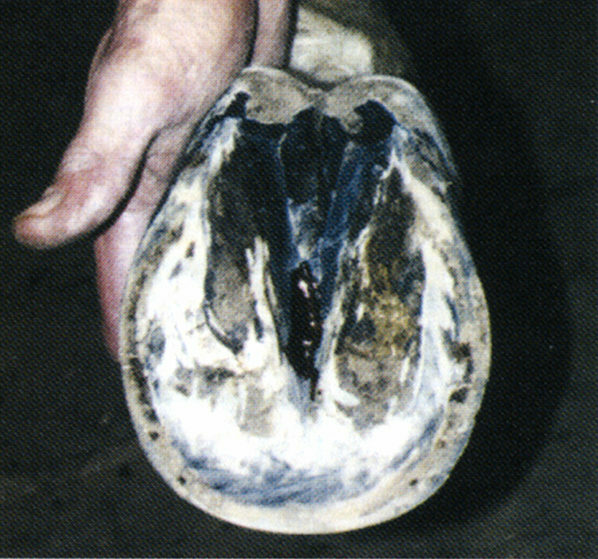 The navicular bone is situated adjacent to and just to the rear of the coffin bone within the hoof capsule. Two strong ligaments, the suspensory ligament of the navicular bone and the impar or distal navicular ligament hold it in place. It makes up about 1/3 of the floor of the coffin joint. 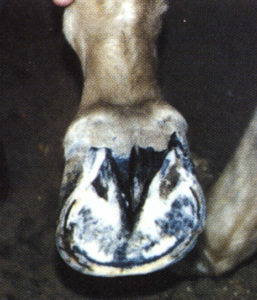 The short pastern bone rests on the coffin bone and the navicular bone. Because the navicular bone is a separate entity and held in place by ‘elastic’ ligaments, the rear 1/3 of the coffin joint can ‘hinge’ or move to dissipate some energy as the pastern drops. 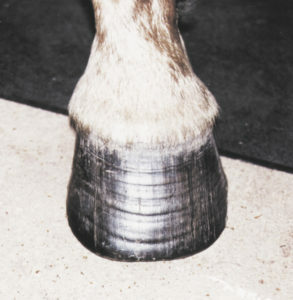 The hoof capsule can be described as those insensitive, protective, weight bearing structures of the foot consisting of the hoof wall, white line, sole, frog, bars and bulbs. 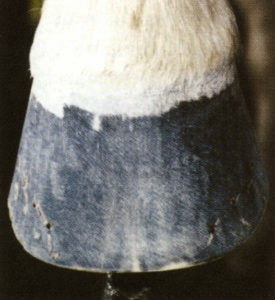 The hoof wall takes the general shape of a cone with the top cut off. Foundations are strongest when the base is wider than the top. The function of the wall is to bear weight. It is a constant weight bearing structure, i.e., it will bear weight on hard ground or soft, bare footed or shod. 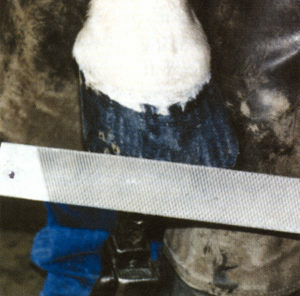 Weight is transferred from the wall through the laminar bed to the bony column of the leg. The wall is designed to temporarily distort under a load. Most of the distortion of the normal foot is measured in the heel area as the heels expand. 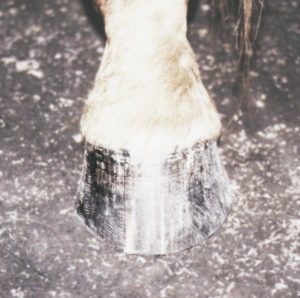 A freshly removed hoof capsule. The soundness of any foot and the regeneration of healthy horn depends on these structures being strong and elastic. 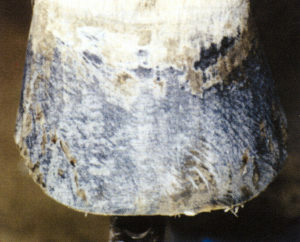 Cross-section of hoof showing how bony column is suspended above ground. 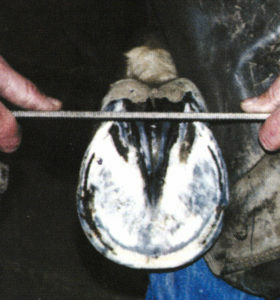 Notice how the hoof wall and white line are bearing weight and the dome shape of the sole. 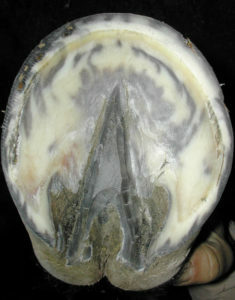 A cross section of rear third of hoof. The bone is replaced with the digital cushion in this area. The shape of frog and commisure allows for expansion as the foot bears weight. 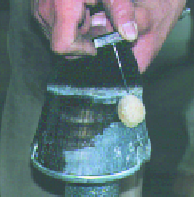 The sole is an intermittent weight bearing structure i.e. ; it bears weight depending on the situation. Obviously, if the foot is not shod and is on soft terrain the sole will contact the ground and bear weight. Only after the wall has taken a considerable amount of the load first though. A healthy dense sole is designed to handle this. If, however, the foot is shod and on hard ground it may not contact the ground at all. But because the sole is the protective foundation of the bottom of the coffin bone, it will take some weight from above. The sole is concave. It is concave because the bottom of the coffin bone from which it grows from is concave. This concave form is no accident. It functions like a leaf spring from a car, which flattens when loaded (due to the weight of the horse from above and the outward distortion of the wall) and returns to its original shape when unloaded. When soles are over pared one not only exposes the underlying sensitive sole to bruising and potential changes of the coffin bone but also, weaken this natural ‘dome’ and the ability of the sole to rebound back to its original shape. This results in flatter soles. Flatter soles result in less upright walls that are not as strong. The white line joins the sole to the wall. It can be likened to the rubber caulking between two cement pads at a pool. It is an elastic bond between the sole and wall that allows for some movement. The white line does not run from the ground to the coronary band but is only as thick as the insensitive sole. 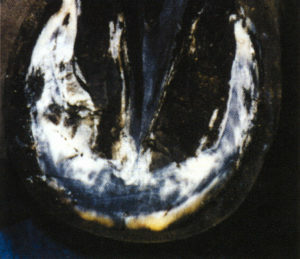 The white line begins at the junction of the sensitive laminae and sensitive sole. It is a constant weight bearing structure. 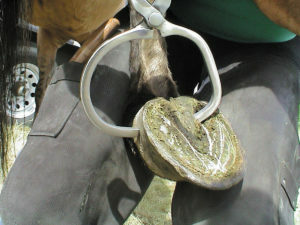 The normal healthy frog will take up about 1/3 of the bottom surface of the hoof. 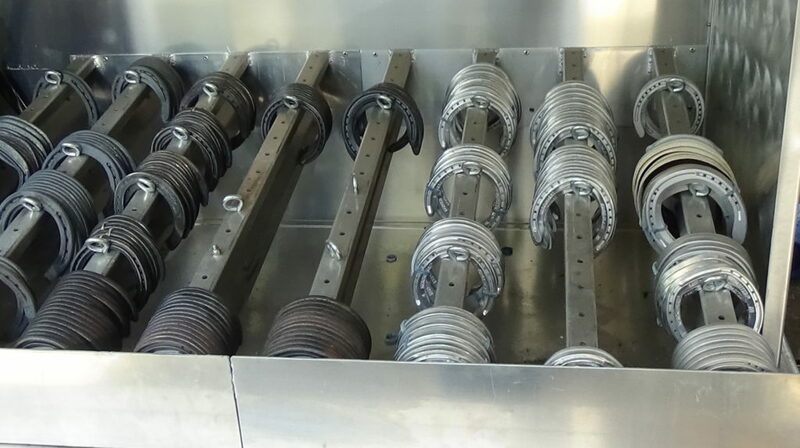 It is an intermittently weight bearing structure. It has a triangular shape with the base of the triangle being even with the buttress of the heels of the foot. The frog is an important component of the natural traction capabilities of the foot. The triangular form furrows into soft ground, much the same as a plowshare does, helping the foot stop. The soft fleshy feel of the frog helps the foot to grip hard ground as the horse turns and sets up to breakover. The frog originates from its sensitive counterpart, the sensitive frog, and is connected to the hoof capsule by way of the commisure. When viewing the foot from behind the frog has the shape of a W. This form facilitates the expansion and contraction of the heel area under the strain of a load without sacrificing strength. The bars are sometimes a forgotten structure of the foot. They are formed as the wall folds in on itself at the buttress of the heel. 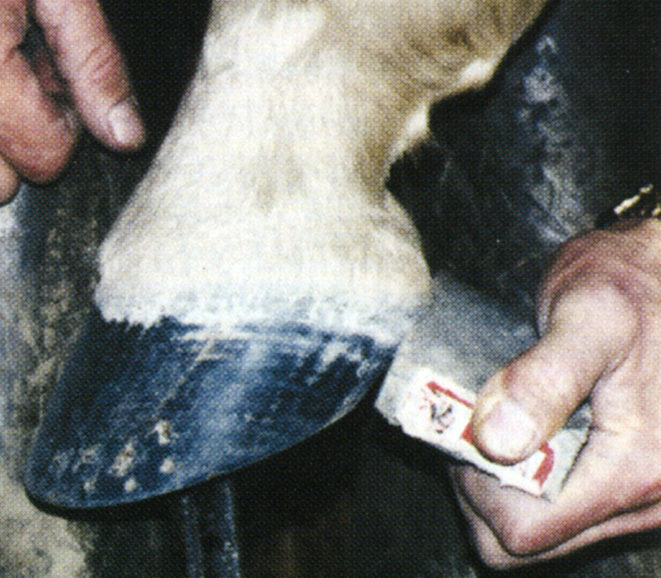 Commonly over pared, they are crucial for hoof strength. Think of the bars as internal struts of the capsule. Much like the cross members on the legs of a fold up table help it to be more stable, the bars help increase the foot’s stability. Up to this point we have only really talked about the insensitive hoof capsule and its bones. It is important to remember the inner sensitive structures as well. These structures comprise vasculature, fibrous cushions, interlocking laminae and cartilage. 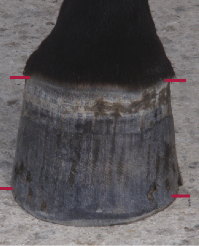 The health of these underlying tissues is dependent on the structural integrity of the hoof capsule and its ability to hold up under less than desirable conditions. Therefore, as stewards of the feet we must know anatomy, respect the horn that constitutes the hoof capsule and employ sound farrier principals to promote healthy growth of the foot. This article is from The Natural Angle Volume 3, Issue 4 – written by Mitch Taylor . For more Natural Angle articles and tips, click here. Currently, Mitch is the director of the Kentucky Horseshoeing School in Richmond, KY, and received the AFA’s “Educator of The Year” award for 2007 and 2011, as well as the Clinician of the Year award for 2012. In addition, Mitch was named the 2015 Rising Star Instructor by the Kentucky Association of Career Colleges, chosen from among 200 instructors in every field of career education. In 2015, Mitch was inducted into the International Horseshoeing Hall of Fame, an honor bestowed on only the few considered the Elite throughout the industry.